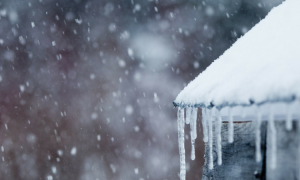 Snow, ice, and blasting winds can do a number on your home. Storms can also damage your property after the fact, as snow melt can lead to flooding and leaks. Here’s what you can do to protect your home before the next storm hits. After a very mild start to winter, the big snow storm that hit Philadelphia in January was quite a surprise. If you rested on your laurels and didn’t do much to prepare your home for cold weather or snow, you might have found yourself dealing with storm damage, whether in the form of flooding or burst pipes. Even if you didn’t have to deal with damage from the last blizzard, protecting your home now can reduce any risk of future damage. The city’s code requires residents to shovel the sidewalk in front of their homes no more than six hours after the snow fall ends. You’re supposed to create a pathway that is either 12 inches or 36 inches wide, depending on the width of the sidewalk outside of your house. 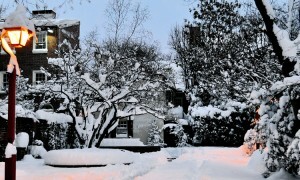 Since piling snow in the street is illegal, many people pile the snow against their homes. But, that can lead to further storm damage, as the melting snow can seep into the foundation or flood into the basement. Instead of stacking snow against your home, redirect it towards the outer edge of the sidewalk (not in the street) so that it melts away from your building. The gutters and downspouts on your property help water flow away from your home. But, they can only do that if they are relatively free of debris. Additionally, the downspout should direct water away from the building. Before the next big storm, take a look at the downspout. If it’s high above the ground and sends water shooting down, consider adding an extension to it and positioning the end of the extension to keep water as far from your foundation as possible. Water pipes that run through colder areas of the home, such as in a non-insulated attic or basement, or along the outer walls of the house, can freeze and burst in the middle of a bad storm. One way to keep that from happening is to keep those pipes as warm as possible. You can purchase special insulating foam sleeves for the pipes, but if you’re really in a bind, wrapping them in a few layers of newspaper can provide sufficient insulation. Having a trickle of water running from the kitchen sink and bathroom sink can also reduce the risk for freezing. The weight of heavy snow on a roof can cause it to collapse. While climbing up on your roof to shovel the snow off of it is not a safe idea, investing in a roof rake, or constructing your own, can be. You use the rake to slide snow from the roof, while you stand safely on the ground. It works best on roofs that are slightly slanted and that are low to the ground. 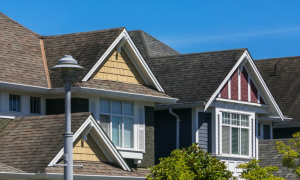 If your home is more than two stories, it probably won’t be tall enough to be effective. Snow and ice melting and refreezing on your roof can lead to a build up of ice, which can in turn cause leaks and other damage. One way to minimize snow melt on the roof is to keep the attic cool. Seal off any holes in ceiling lamps or fans, to keep warm air from seeping up there. Sealing your attic will have the added benefit of keeping the heat in the rest of your home. Whether Philly will see another storm this winter remains to be seen. But, protecting your home from damage is a good idea, no matter what. When repairing a roof, it is critical to not just patch it, but to rebuild it so it is capable of withstanding future events.